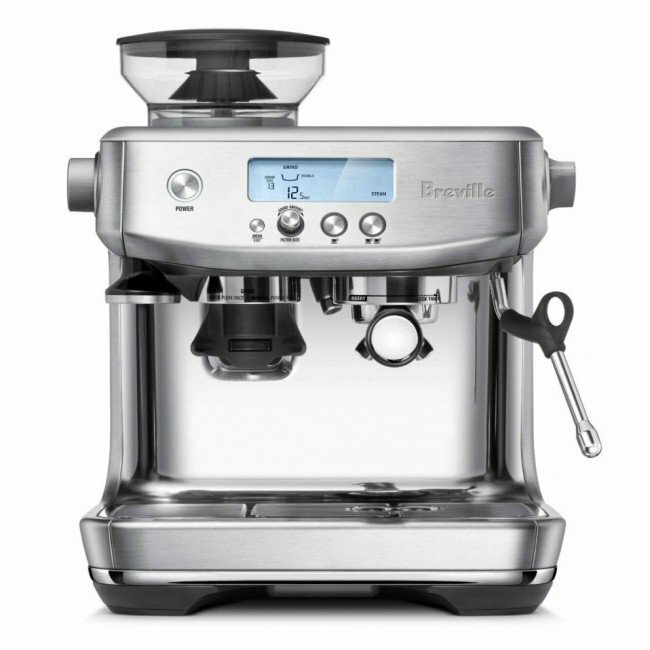 Breville's focus on user experience shines through with the new Breville Barista Pro. A strong update to the renowned Barista Express, the Barista Pro brings better usability in a sleek and shiny new case. At the center of the new 'pro' moniker lies Breville's new ThermoJet heating system. Heat-up time is greatly improved over their earlier machines—greatly reducing the delay between brewing and steaming. This improved workflow moves you from shot prep to latte art faster than any machine at its pricepoint. Other improvements include a backlit digital screen that provides grind and shot times, a redesigned hot water spout, and a curvier, polished steel backsplash and case. Built-in Grinder - The Barista Pro's built-in grinder helps keep your countertop cafe contained in a small, single package. ThermoJet Heating Element - Significantly faster to heat than Breville's older thermocoil design, steaming is now almost instantaneous. Digital Control - A backlit digital display gives you clear control over grind size, time, shots and menu settings. Programmable Shot Control - Program shots volumetrically for accurate espresso, every time. Convenient Baskets - The Barista Pro includes both pressurized and non-pressurized baskets—making it useable for novices and enthusiasts alike. Hot Water Spout - An angled hot water spout dispenses directly into the cup for on-demand tea or americanos. All-in-one - The Barista Pro continues the line in excellent combo machines from Breville. The compact nature of a combo machine and grinder makes it an easy choice for those with limited space in their kitchen. Design Refresh - Brighter, cleaner, and faster than the original Barista Express, the Barista Pro elevates Breville's everything machine to new heights. Speedy Steam - The new thermocoil system narrows the gap between entry-level machines and more expensive HX and dual boiler designs. A virtually nonexistent delay between brewing and steaming makes workflow significantly better than other machines at this pricepoint. Still Messy - The downside to a combo machine, the shared drip tray below grinder and brewer excels at creating a hard-to-clean coffee sludge. Similarly, the new polished backsplash looks great—when not covered in espresso. Clean early and often. While the updated steaming makes a huge difference in TTL (time to latte), the Barista Pro still took nearly 40 seconds longer than a commercial heat-exchange machine. Setting your grind time to half-dose lets you pause and distribute your portafilter, minimizing grounds in your drip tray. Wash out drip tray regularly.